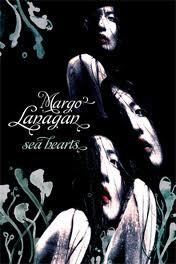 Margo Lanagan should need no introduction, but I’ll give her one anyway. Or rather, I’ll snurch this one from the Allen & Unwin website: Margo Lanagan is an internationally acclaimed writer of novels and short stories. 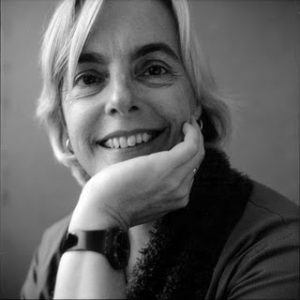 Her collections of short stories have garnered many awards, nominations and shortlistings. Sea Hearts won the CBCA Book of the Year, WA Premier’s Literay Award, Aurealis Award and Barbara Jefferis Award, and was shortlisted for the Adelaide Festival Award for Literature, NSW Premier Literay Awards, Queensland Literary Awards among others. 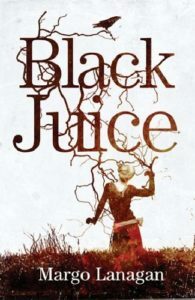 Black Juice was a Michael L. Printz Honor Book, won two World Fantasy Awards and the Victorian Premier’s Award for Young Adult Fiction. Red Spikes won the CBCA Book of the Year: Older Readers, was a Publishers Weekly Best Book of the Year, a Horn Book Fanfare title, was shortlisted for the Commonwealth Writer’s Prize and longlisted for the Frank O’Connor International Short Story Award. 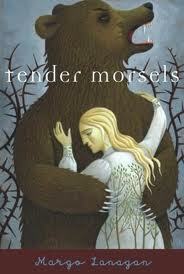 Her novel Tender Morsels won the World Fantasy Award for Best Novel and was a Michael L. Printz Honor Book for Excellence in Young Adult Literature. Margo lives in Sydney. In short, she is awesome and she’s taken some time to chat. 1. What do new readers need to know about Margo Lanagan? Going by the reaction of a couple of recent new readers, they need to know that Margo Lanagan stories are maybe not what you think of when you think of fantasy. (I don’t know any more if this means they have wider or narrower appeal! Probably narrower.) If you’re the sort of reader who races through a story, you might have to slow down a little. If you’re reading one of my collections first, read no more than one a day to properly enjoy them. Also, you’ll perhaps be more unsettled than enchanted. 2. 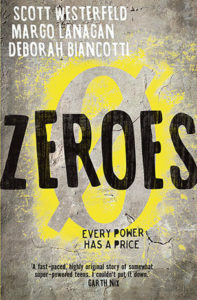 How did your Zeroes collaboration with Deborah Biancotti and Scott Westerfeld come about? Deb and Scott cooked it up, inspired by the TV writing-room model of collaboration. Then they realised that two people do not a writing-room make, so they asked me along, I’m guessing so that they could have someone to gang up on and laugh at (sob!). That’s not true, actually, the gangs constantly switch and change, and there’s more good laughter than bad. But fuelled by beer, we chewed over the teen-social-superpowers possibilities for a few months in 2013, then got seriously into writing book 1. We sent off sample chapters the following May, and we pretty much had a deal for the trilogy by the end of July. 3. Was it a strange experience switching from solo writer to an unholy trinity? It was hugely relaxing not to be 100% responsible—I’ve tried and failed at solo series fiction before and I know for a fact that this head can’t hold an entire trilogy. It took a bit of getting used to, showing other people what were essentially first drafts, and getting back … well, the kind of critique you’d expect for a first draft. But the plotting meetings, which are 3-day away-from-home numbers, were a revelation—the ideas flow fast and furiously, there’s the aforementioned laughter (which is rare-to-nonexistent when I write on my own), and we speak almost a different language because we can assume so much about what the others know. I actually think the solo-to-group transition has nothing on the returning-to-solo transition. What, I have to do everything myself again? So not fair. 4. What was the first story you read that made you want to be a writer? I wouldn’t be able to tell you. I was one of a family of avid readers. Being a writer was like being a rock star; it wasn’t something an ordinary girl like me could grow up to do. I footled around at the edge of writing (i.e. wrote poetry) in my teens and twenties. Then I did some work as a freelance editor, mostly of non-fiction books. I saw the state in which some manuscripts came in. I did the work of hauling them back from the brink of incoherence. And then I realised that it might actually be more efficient for me to start writing a book myself, from scratch. Not to mention more fun. Maybe even more lucrative? So I had a go. You could say I was irritated into being a novelist. 5. What solo projects are waiting for you to come back to them? I’ve just told my agent that I’m looking at the twitching corpses of two novels—one is selkies related, the other is convicts-and-goddesses. They’ve both been extensively revised many times. I hate, loathe and despise them both. I’m trying to be professional and regard them as just information about what went wrong, as Toni Morrison advises. Girding my loins to go in again. Meanwhile I’m working on some short stories to go in a best-of collection that will probably come out in May 2017. Alan Garner, Helen Garner, Susan Cooper, Patricia Wrightson, Mervyn Peake (Gormenghast), Jo Walton (Among Others), George Saunders, Kelly Link. So many others. So many heroes. Anyone who has a novel to the submitting stage or beyond is my hero at the moment. 7. If we could overcome the twin annoyances of tempus fugit and distance, which authors would you invite to dinner tonight? I’d recreate a lovely Sydney-Writers-Fest-related lunch Steven and I had down at the wharfs a few years ago with Tobin (M.T.) Anderson, Nicole Griffin, the late Mal Peet and Elspeth Graham. 8. Name your five favourite leading characters in literature? OMG, Angela, these questions are hard. Only five? Okay. Right now, I’m enjoying watching Karl Ove Knausgaard labour through vol. 3 of his My Struggle. The character “Helen” in Helen Garner’s The Spare Room. Serena, in Ron Rash’s Serena—now a movie, but ignore that and read the book. Sabriel, in Garth Nix’s Abhorsen trilogy. And whichever unhappy, ruminative German point of view W. G. Sebald chooses. 9. Which fairy tale/folk tale/myth/legend do you think holds the richest vein for your work? I think I’m still trying to excavate myself from selkie stories. But also, anything Grimm, especially if it involves bleeding feet or animal transformations. 10. What’s next for Margo Lanagan? Well, I’d better get back to those shorts I’m working on. Oh, and there’s the third volume of Zeroes to be whipped into shape—the second one’s pretty much done and dusted and we’re working on the big finale. As for a new novel, I’m trying not to frighten myself. Maybe after the shorts I’ll raise my sights as far as a novella. But I have no inkling what it would be about yet. If you see any good ideas running loose and unclaimed, send them my way! This entry was posted in fairy tales, News and tagged Alan Garner, black juice, Deborah Biancotti, fairy tales, Garth Nix, George Saunders, Helen Garner, Hild, Jo Walton (Among Others), Karl Ove Knausgaard, kelly link, margo lanagan, Mervyn Peake, Nicole Griffin, Patricia Wrightson, Red Sparks, Scott Westerfeld, seahearts, selkies, Susan Cooper, tender morsels, The Brides of Rollrock Island, white time, Yellow Cake, Zeroes. Bookmark the permalink.